Sunday, March 31, Lent IV, Mothering Sunday: Renewal of the Electoral Roll – please ask Jill Pirdas for a form or download a form and return it to her by email or by hand (the deadline is Sunday, April 14). Concert by Les Choralines at 4 pm. Wednesday, April 3, Eucharist at 10.30 am. Sunday, April 7, Collection for Fourneau Economique. Concert at 4 pm given by Corason, in aid of charity. Wednesday, April 10, Eucharist at St Hugh’s (none at Holy Trinity). St Hugh’s AGM and lunch follow. Sunday, April 14, Palm Sunday, Sung Eucharist and Procession of Palms; Community Lunch after the Eucharist (proceeds to the Indian Project for children living with HIV). We’re very grateful to Bishop Stephen Platten for presiding and preaching at the Eucharist last Sunday. Congratulations to everyone who successfully negotiated the dreadful disruption caused by the visit of the presidents. Next Sunday is Mothering Sunday, the fourth Sunday in Lent. Its character derives from several customs. It probably replaces a Roman spring festival – so it has a spring feel, expressed by the gift of flowers. Once it was a time for people to go to their closest major church– their mother church – where they had been baptised. This was called ‘going amothering’ – so the ‘mother’ connection has its roots there; and the prayer originally set for today refers to Jerusalem as ‘the mother of us all’. 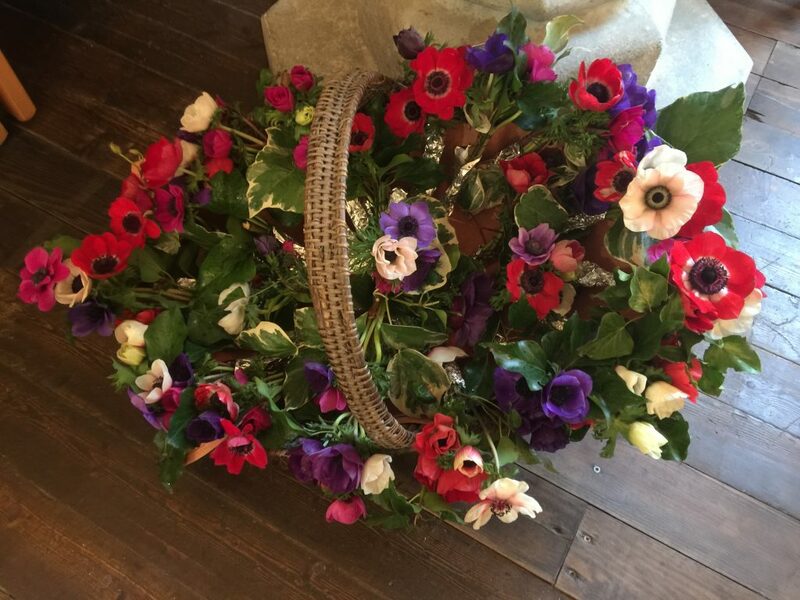 And both ‘mother’ and ‘spring’ were reinforced by the later custom of releasing young girls who were in service to go home for a day’s holiday to visit their mothers and families: they’d pick flowers from the hedgerow as they wended their way home and give them as presents. The initial focus of the parable is on the younger son who abandons his family and wastes his gifts. Having sunk to the level of tending pigs – a symbol of exile, as Jews don’t keep or eat pigs – he thinks it would be better to return as a servant in his father’s house. To his surprise, his father is looking out for him and welcomes him home as a son, restoring him to the status that he once had. In spiritual terms, this means that God (the father) is always looking out for us, wanting to restore us to the status of his children, even if we have treated him as though he didn’t matter or as if he didn’t exist (which the younger son has done, effectively treating his father as dead: asking for the inheritance that normally follows someone’s death). The parable changes focus at the end. The elder son who has stayed at home is jealous of the welcome given to the returning prodigal. He wonders why there is such a fuss over the one who has wasted his life. The elder son wants his good behaviour to be given the equal (or greater) recognition. Even though his father reassures him that he has always been valued, he remains resentful. The elder son mirrors the self-righteous tendency in religious people. If we have belonged to a church for a long time and treated our neighbours decently, we may resent newcomers or – following the parable more literally – be reluctant to reach out to the less fortunate in society.